One of the many great things about High Dynamic Range (HDR) photography is that it's not just limited to color, HDR works beautifully with infrared photography too! The process of HDR brings out extreme detail that isn't always possible with a single exposure. For example, I photographed the engine detail of a C-47 vintage aircraft after the cowling was removed. All the wonderful components of the engine were visible as the engine was being worked on. From my angle, I was able to photograph this warbird using a Nikon 70-200mm lens and capture the amazing clouds in the background. 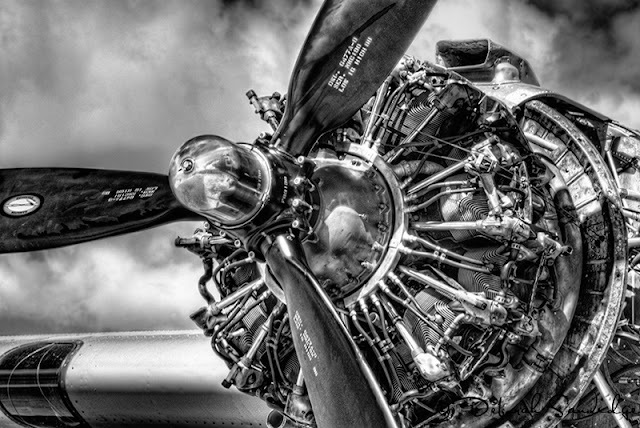 The process of shooting infrared enhanced the clouds and sky, while HDR provided definition for the intricate parts of one of the engines of this magnificent aircraft. If you are interested infrared photography and HDR, please check out my book Digital Infrared Photography Photo Workshop. Tip for shooting HDR - The dynamic range of the scene you are shooting may often be greater than two stops over and under the metered exposure. Double check your exposures to be sure you've captured enough detail in both the highlight and shadow areas by reviewing the camera histogram. Have fun shooting!